Gilkock Football Academy on the 5th of November received a set of Jerseys from Margie Macggot and husband a British couple resident in Brufut. 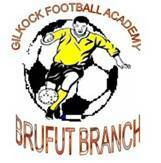 November 15th the entire community of Brufut was glad after receiving in the air waves the website for Gilkock Football academy Brufut Branch. Coach Sang Mendy and Boris Demba on behalf of the academy received materials from the Pickett family through Malleh Jagne. The materials range from a computer and printer for an office, training cones, football shoes, shin guards and a set of Jerseys. In the same package the academy received 8 footballs and a training DVD added to the ones sent from Greg Pickett. These DVD’s will enhance and widen the scope of our trainers and coaches. Towards the end of November Jap and wife Anna of Lutjebrock in Holland also donated two sets of Jerseys to the academy.